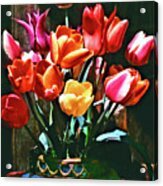 A Time For Tulips by Michael Durst - 6.625" x 10.000"
A Time For Tulips framed print by Michael Durst. Bring your print to life with hundreds of different frame and mat combinations. Our framed prints are assembled, packaged, and shipped by our expert framing staff and delivered "ready to hang" with pre-attached hanging wire, mounting hooks, and nails. Stunning artwork, Michael!. I invite you to post this beautiful piece to the Amazing Still Life Artwork Group. It will surely make a great addition to that Group.F/L. lovely lighting and colors... F/L & Voting. You're welcome, Jane. And thank you for creating such a great contest! 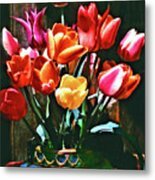 Thank you for entering the tulip contest. Thanks so much, Ana Maria! Coming from you that is such a compliment! How vibrant and lovely, and full of sunshine. A photograph of a beautiful arrangement of tulips in a barn. 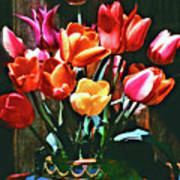 Spring is such a joyous time of the year, and tulips are its messenger.